The Morning Show is a great community resource for weekly events, news, sports, weather, interviews with community officials and organizations, birthday and anniversary announcements and more! Don't miss your chance to listen! 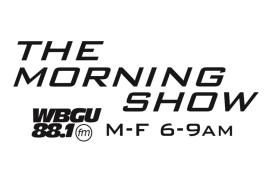 The Morning Show broadcasts live, Monday-Friday 6am-9am, from the Kuhlin Center at BGSU; a state-of-the-art media facility. To listen online, please visit WBGU FM and click the "Listen Live" button. For those in the Bowling Green area, you can find The Morning Show at 88.1 FM on WBGU. Follow them on Twitter @MorningShowBG and Facebook to hear about their upcoming guests and more! Click here to listen in the most recent interviews with Larry Weiss. Join Clint weekday mornings to hear about: local news, local weather report, community programming/calendar, financial market report, daily commodities, Klotz garden report, coaches show with coaches from BGSU and BGHS, and live news maker interviews! You can follow Clint on Twitter @ClintCorpe. Thank you to the underwriters of The Morning Show with Clint Corpe! AA Green Realty Inc., Al Smith Chrysler Dodge, All State, BG Orthopedics, BGSU Bookstore, BGSU Marketing and Communications, Bowling Green City Schools, Bowling Green Community Foundation, Bowling Green Lincoln Auto Sales, Bowling Green Manor, First Federal Bank, Frontier Communications, Gearhart Plumbing, Holiday Inn Express, Klotz Floral Design & Garden, Main Street ACE Hardware, Otterbein Portage Valley, Wood County Historical Center, Wood County Park District, Wood Haven Health Care, Wood Lane, and regional support from Cedar Point, Toledo Zoo & Aquarium, and the Detroit Red Wings! Be sure to join Larry from 6am-9am Monday-Friday during the fourth week of each month. Larry does his best to make sure your day gets off to a most interesting and enjoyable start with: local news, local weather, local sports, wonderful music, daily in-depth interviews: hear periodic reports from Wood County Hospital, Bowling Green City Schools, BGSU and many other news makers in BG and Wood County, community events, monthly report from the Mayor, monthly "business spotlight", monthly Chamber of Commerce report, special programs throughout the year commemorating historic events and holiday and much more! You can follow Larry on Twitter @LarryMorningSho. Most recent interviews with Larry Weiss. Thank you to the underwriters of The Morning Show with Larry Weiss! BGSU Alumni Association, BGSU Athletic Department, BGSU Student Union, Bowling Green Chamber of Commerce, Bowling Green Community Foundation, Bowling Green Vision Center, Citizen Advisory Group, DACOR Internet Services, Downtown Bowling Green, Dunkin', Dunn Funeral Home, Falcon Health Center, Finders Records, Glass City Federal Credit Union, Hal's Barber Shop, Newlove Realty, Organ Collision Ltd., Poco's Playhouse, SASS Salon & Spa, St. Mark's Lutheran Church, Sunset Bistro, Wood County District Public Library, and Wood County Sheriff Mark Wasylyshyn! Since its inception in June of 2007, "The Morning Show" on WBGU Radio, 88.1 FM, has been a major success. 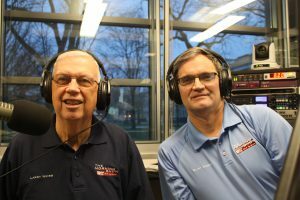 In part, because many conscientious businesses and organizations have stepped forward to help underwrite the only local news and sports radio program in Wood County. The Chamber, BGSU and Dave Horger were instrumental in making the show a reality. Now Clint Corpe and Larry Weiss continue the commitment to make sure this important and unique public service remains on the air. You can be an essential part of its continued success. The Chamber offers businesses and organizations an opportunity to be an underwriter. Under the umbrella of the Chamber, you'll receive your "mentions" each month during either news or sports programming or feature segments. It's a wonderful, affordable opportunity to be part of something very special in Wood County!